Both Apple's AppStore and Google's Play store allow mobile developers to create In-App purchase products through their web consoles. Typically these purchasable products will be created with names, types, and prices. SDKBOX LiveOps allows you to decide on-the-fly which of these products should be sold in your app. For example, let's say you have a product called "Chest of Coins" in the app which is selling for $3.99. For the coming holiday, you wan to promote it on sale for $0.99. We will use SDKBOX In-App Purchase sample project to show you how to do that without releasing a new build. 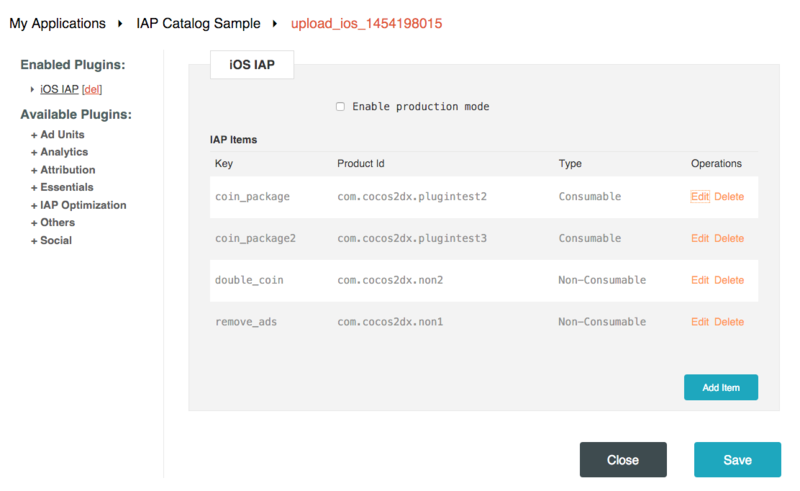 Notice in the xcode console, there are debug logs showing all the IAP products initialized when app starts. The one called Chest of Coins has a price tag $3.99. We will change it next. Open AppDelegate.cpp, you can find the paragraph about sdkbox::init("***", "***"). Those enable the sample app to use a remote configuration. It's currently referenced to our samples. Got to sdkbox.com, create a application, and upload the sdkbox_config.json from this sample. Remember to publish the config Live. The item with key name coin_package is mapped to product with id com.cocos2dx.plugintest2, which is setup as price tier 4 ($3.99). Click on Edit of this item, and change the product id to com.cocos2dx.sale.1. Now you should see this: . Save and publish the new config to the cloud. Now, restart the test app. You should see the sale item is initialized in the log. Purchase "coin_package" will promote for only $0.99! Build Date UTC :2019-04-24 14:26:10.506897, Documentation built with MkDocs.